If you’ve ever been fitted for an oral appliance, crown or dental bridge from your dentist, you likely underwent an uncomfortable process in which a putty-like impression was taken of your teeth and/or bite. This involves biting down on a gooey, strange-tasting tray of material in order for your dentist to get exact measurements of your teeth. If you’ve gagged during a dental impression or deeply dreaded the procedure, you are certainly not alone. The good news is that modern dental technology is transforming those unpleasant experiences at the dentist – including getting a dental impression. 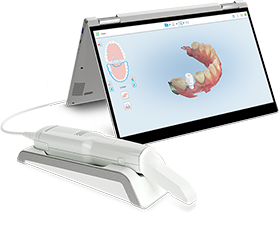 Today, with the use of the iTero oral scanner, we can build a highly-precise, digital impression of your teeth without the use of gooey, uncomfortable and foul-tasting material. A: The iTero is a handheld intraoral scanner with a laser light and sophisticated camera technology. The imaging wand looks quite similar to a large Wii remote. A: The iTero wand scans your entire oral cavity once it is placed in your mouth. These images, which are captured in just seconds, are used to create a virtual 3D model of your teeth and bite. Dentists and patients can instantly view the model on a chairside monitor for easy education or a sneak peek into what your Invisalign treatment results can look like. Q: When is it used? A: Dr. Park may use the iTero scanner for any situation that would otherwise require a traditional dental impression, such as a night guard, athletic mouthguard and Invisalign as well as dental crowns, bridges, implants and more. A: Absolutely. The iTero does not emit any ionizing radiation during the imaging process. You may be asked to wear sunglasses, however, to protect your eyes from the bright light. The benefits of using the iTero scanner are plentiful when compared to traditional impression techniques. The iTero is overall more comfortable for the patient, more accurate, faster, more eco-friendly and more sanitary. At Green Dental of Alexandria, we take pride in our commitment to invest in the latest dental technology. We hope our equipment will not only better patient experience, but also improve smile results. To learn more about the iTero Scanner, please call our office today.